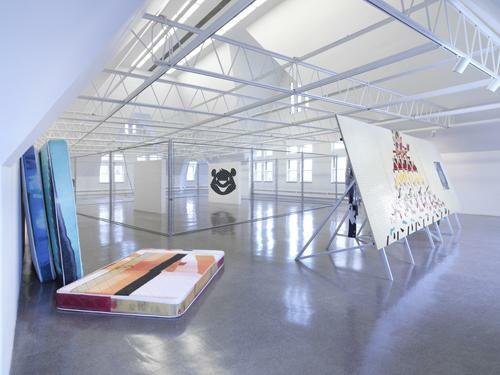 Teen Paranormal Romance Installation View, 2014. Photo: Tom Van Eynde. Courtesy of The Renaissance Society at the University of Chicago. Join us for the West Coast premiere of Teen Paranormal Romance, a group exhibition featuring Kathryn Andrews, Ed Atkins, Chris Bradley, Roe Ethridge, Jill Frank, GuytonWalker, Anna Gray & Ryan Wilson Paulsen, Anna K.E., and Jack Lavender. Artworks in this exhibition function in response to “Teen Paranormal Romance” literary genre, characterized by adolescent romantic love and supernatural phenomena of fantasy, science fiction, and horror. Exemplified by series such as Twilight, The Hunger Games, True Blood, and theDivergent trilogy, the popularity of this fiction forms the basis for understanding themes of dystopia, adolescent impulses, and escapism in contemporary art. This exhibition was organized by Hamza Walker, Director of Education and Associate Curator at The Renaissance Society at The University of Chicago. He was also recently selected to co-curate the Hammer Museum’s Made in L.A. 2016 biennial.